Israeli Prime Minister Benjamin Netanyahu has said the Israeli military will continue to defend its territories against terrorist organisations amid a fresh spate of violence in the Gaza Strip. 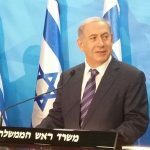 Reacting to violent protests in which Israeli security forces killed over 58 Palestinians on Monday, Netanyahu said their military actions were justified considering they had an “obligation to defend” their territories against a terrorist entity who had sworn to “destroy Israel”. The spates of violence in the Gaza Strip followed the US inauguration of an American embassy to Israel in Jerusalem. The inauguration incensed the Palestinians who perceive the move as a sign of US backing for Israel’s claim to Jerusalem. To compound matters, the US declined to join their European allies in urging Israel to exercise caution in dealing with the protests which have injured 2700 Palestinian protesters, according to Reuters. Senator Tim Kaine, the top Democrat on the foreign relations subcommittee in the Middle-Eastern region bemoaned the US stance saying the Trump administration was making a “sad decision” by walking away from the problem instead of solving it.